The presence of two strong personalities roughly the same sphere of influence is a perfect recipe for mimetic rivalry that can tear the social fabric apart until it is resolved either through implosion or collective violence against a victim. There is evidence that precisely these sorts of tensions played out between Saints Peter and Paul but there is also evidence of attempts at reconciliation between the two and further reconciliation on their behalf in the early Church to provide a very different model for the relationship between two strong outstanding personalities. In the Acts of the Apostles Luke seems to have taken great pains to balance the impact of the missionary work of these two apostles under the guidance of the Holy Spirit. That Peter drops out of the narrative half way through the book and the seemingly abrupt ending with Paul awaiting trial in Rome diminishes the importance of even these great saints and emphasizes their subordination to the Holy Spirit. At the momentous Council of Jerusalem where the two apostles meet, at the heart of the book, the situation is ripe for conflict, but Luke presents the Council as an amicable solution to their conflict. Luke heightens the reconciliation by having Peter speak up Paul him in with words that sound a lot like a speech Paul could have made himself. That is, Peter imitates Paul to support his position at a time when he could have become a mimetic double in conflict with him. Peter’s earlier struggle over the appropriateness of preaching to of the Gentiles resolved by his vision of a sheet coming down from Heaven with both clean and unclean animals on it sets up this reconciliation. James plays the role of the mediator who states the amicable solution that allocates a separate sphere for Jews and Gentiles so that the two groups need not compete but are given space to follow the guidance of the Spirit. Paul’s letter to the Galatians tells a different story full of tension. Although Peter and gave Paul received “the right hand of fellowship” in Jerusalem, he later found it necessary oppose Peter “to his face” for rejecting table fellowship with Gentiles. Perhaps Peter had suffered a relapse of his own tendency to be swayed by the wrong mimetic crowd, such as happened to him in the courtyard of the high priest when he was surrounded by fellow Jews were against that fellowship. We never learned if this quarrel was ever healed between them in this life before it was healed posthumously in the hagiography and liturgy of the Church but there are hints that it probably was. In writing to the Corinthians, Paul took pains to quell rivalry that had triangulated him with Peter by taking them severely to task for using such slogans as: “I am for Paul,” “I am for Cephas.” Far from fanning the flames of conflict, Paul distances himself from it in no uncertain terms and renounces any possible gain he might get from the “Paul” Party in Corinth. Although Peter is not believed to be the author of the Second Epistle bearing his name, it is significant that he refers to “our brother Paul, who is so dear to us.” At the very least, these words attest to the Church’s corporate effort to maintain a peaceful relationship between the two apostles. Peter says that Paul wrote “with the wisdom that is his special gift,” but then he cautions his readers that some points in Paul’s letters are hard to understand and are “easily distorted by uneducated and unbalanced people.” Tension and reconciliation between the two great apostles are themselves held in close tension here. A generation later, St. Clement of Rome writes the Corinthians to rage over an “abominable and unholy schism” in the community fueled by jealousy and envy. As a counter-example, Clement describes the deaths of Peter and Paul, stressing the harmony between the two great apostles. A century or so later, St. Ireneaus called the Church of Rome “the greatest and most ancient Church, founded by the two glorious apostles, Peter and Paul.” Archaeological investigations along the Appian Way have unearthed rooms with inscriptions honoring both saints together and a bronze medal dating from the first half of the second century pictures the heads of the two saints on the same side of the medal. The Golden Legend, a 13th century compilation of saints’ lives by Jacob of Voragine is not the book one goes to for the most accurate history of the early church or anything else, but it is one of the best books for studying the way saints have been presented as models to the faithful. 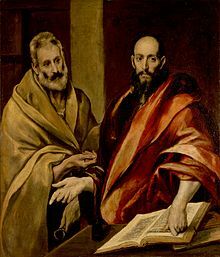 In his entry on Paul, Jacob explicitly curbs the alleged rivalry with St. Peter when he says: “We find that at different times Paul is portrayed as Peter’s inferior, as greater than Peter or as Peter’s equal, but the fact is that he was inferior in dignity, greater in preaching, and equal in holiness.” Jacob seals this unity by affirming the early Church’s legend that they were martyred under Nero on the same day. Before they were parted for their executions, Jacob records that Peter and Paul exchanged benedictions of each other. This reconciliation between these two apostles is effected by their sharing the same feast day on June 29 when the other apostles get a day each for themselves. The Magnificat antiphon for First Vespers of this feast says: “Peter and Paul were at one in their love of the Lord: neither in life nor death were they divided.” The second half of this text comes from David’s lament for Saul and Jonathan (2 Sam. 1:23), so that a verse referring to the protracted mimetic struggle between David and Saul is applied to another problematic relationship to heal whatever division there may have been in real life and offer the Church a model of mimetic amity.